What do you do when photographing a home exterior and mother nature only provides dark gray cloudy skies? A design-build client of mine wanted a good exterior cover image of a recently completed remodel project to go along with all the fabulous interior portfolio photos. Thereby completing the visual story of the project for their company's website and social media marketing. The project was a mountain home remotely located and we only had one day for photo production with rain in the forecast, uh-oh! 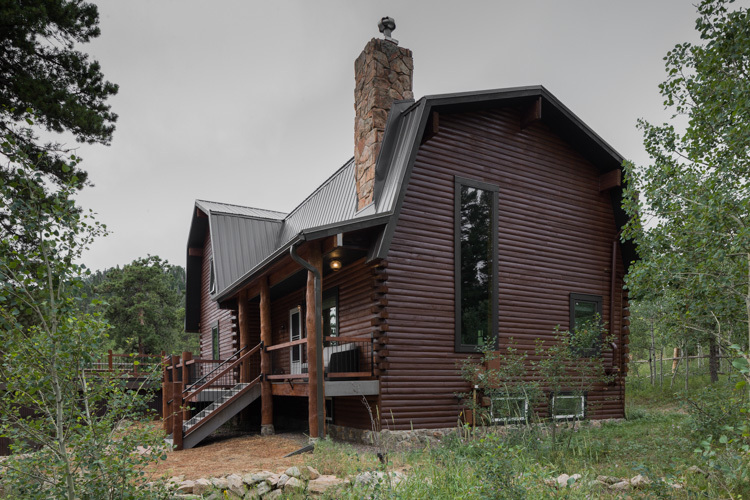 Arriving early in the morning to photograph the east facing exterior, I setup the perfect camera angle so show the best look for the rustic barn styled log home. The client wanted the remodel project's updates featured in the cover image, such as the new large picture and the unique blackout of the roof soffit along with the fresh exterior finish color. Just one problem, the skies were overcast and dark- not the best look for a residential exterior. The best solution was to capture the image with the dark gray sky and replace it with a nice blue sky in post production. A major client benefit to in-house image processing at StudioQphoto.com is the ability to make corrections like these. Hand-crafted image retouching of a architectural photos like this begins with careful selection of the sky using digital tools such as Photoshop® and then replacing the selection with beautiful skies from images in StudioQphoto.com's library of source files. Below is the final image delivered to a happy client! Get high quality architecture exterior photos for your marketing and social media image library by connecting now.